the day to get done all that I have to get done. sunlight, or rather the lack of it. to take pictures for a blog. Can someone please do something about that. I just can not seem to get a good picture anymore. photograph with limited sunlight hours? in the parking lot at work on my lunch hour! right away what I wanted to make with them. I used the recipe from Eagle Brand, and you can find it Here. I use a Lowel Ego light. Love it. The dark and I are friends now. 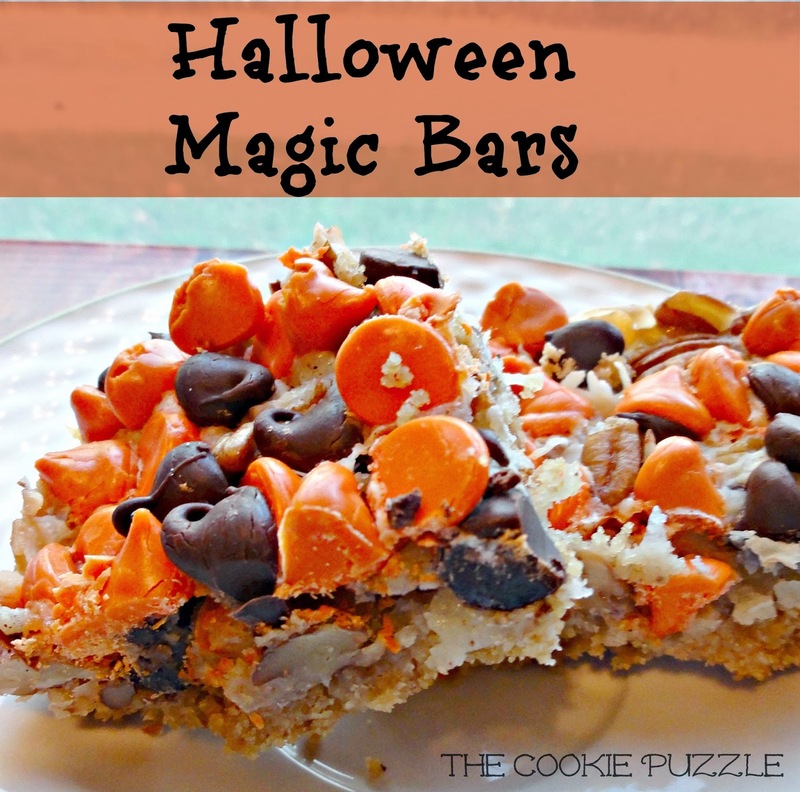 I love magic bars. I wish I had time to make these for Halloween but I want to try them after Halloween when I get the stuff on clearance. 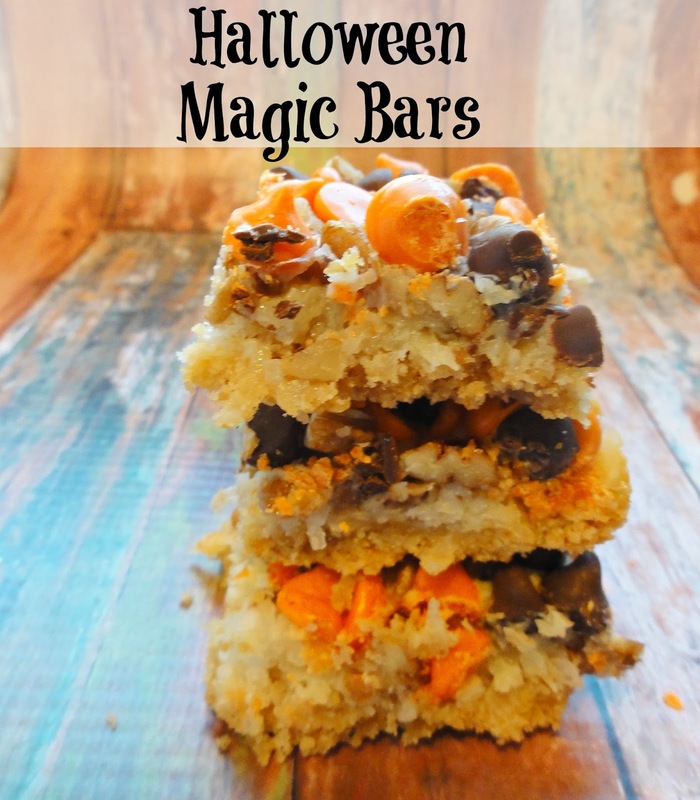 I've never heard them called magic bars, always knew them by Hello Dolly bars as well. So tell me WHY, we don't get any samples at work? 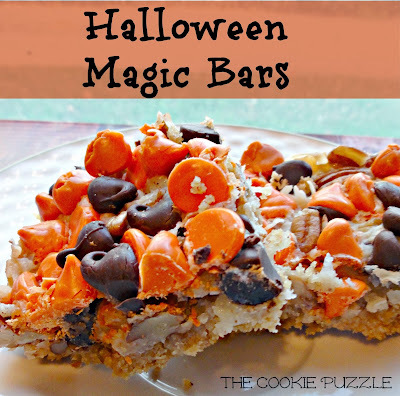 These are a really fun looking Halloween treat! I pinned it! I followed you on all your social media. 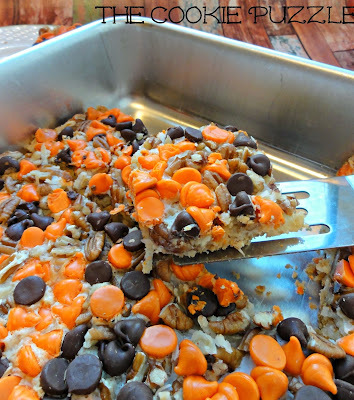 I pinned these also, they look delicious! I plan to make these very soon!! =) Yum! Believe me, if I could make it lighter longer I would! I lived in Arizona where they never change their clocks. Never. How nice is that? Living in California, I dread the time change because I'm dead tired at 7pm. Then I get that whole Seasonal Affective Disorder from lack of sunshine and just want to sleep. Have you tried making a light box? I saw Mike had a great tutorial. We can't live all winter without your beautiful photography, y'know! Thanks for linking up with us at the Four Seasons Blog Hop. This is a fantastic recipe. I had already pinned it. I remember my gramma making these - well the regular ol' magic bars! Love the Halloween twist! :) I have Buffered this to share on Facebook! Thanks so much for linking up to All My Bloggy Friends this week - I hope you have a great weekend! Hello delicious! Thanks for sharing with Time For Mom Tuesday. Hope to see you again tomorrow!